C-17 Globemaster III military cargo aircraft. Military transport aircraft or military cargo aircraft are typically fixed and rotary wing cargo aircraft which are used to deliver troops, weapons and other military equipment by a variety of methods to any area of military operations around the surface of the planet, usually outside of the commercial flight routes in uncontrolled airspace. Originally derived from bombers, military transport aircraft were used for delivering airborne forces during the Second World War and towing military gliders. 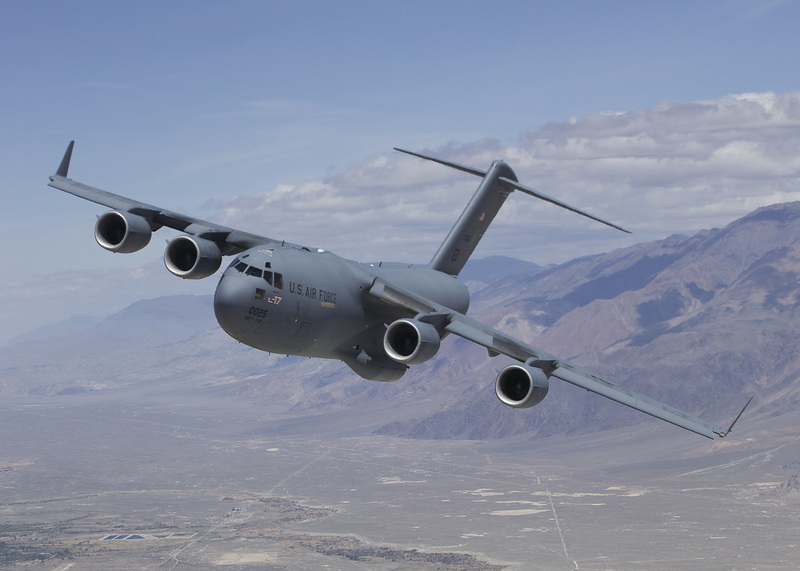 Some military transport aircraft are tasked to performs multi-role duties such as aerial refueling and, tactical, operational and strategic airlifts onto unprepared runways, or those constructed by engineers. A more specialised role of a cargo aircraft is that of transporting fuel in support of other aircraft with more limited flight endurance such as fighters or helicopters. Smaller cargo aircraft, known as "utility", are often used to transport military communications equipment as temporary or permanent platforms, and in the command role by providing airborne command post or as an air ambulance. RAF TriStar refuelling US Navy F/A-18s. Military transport helicopters are used in places where the use of conventional aircraft is impossible. For example the military transport helicopter is the primary transport asset of US Marines deploying from LHDs and LHA. The landing possibilities of helicopter are almost unlimited, and where landing is impossible, for example densely packed jungle, the ability of the helicopter to hover allows troops to deploy by abseiling and roping. Transport helicopters are operated in assault, medium and heavy classes. Air assault helicopters are usually the smallest of the transport types, and designed to move an infantry section and their equipment. Helicopters in the assault role are generally armed for self-protection both in transit and for suppression of the landing zone. This armament may be in the form of door gunners, or the modification of the helicopter with stub wings and pylons for the carriage of missiles and rocket pods. For example the Sikorsky S-70 fitted with the ESSM (External Stores Support System) and the Hip E variant of the Mil Mi-8 can carry as much disposable armament as some dedicated attack helicopters. The assault helicopter can be thought of as the modern successor to the military glider. Finally, there is the generic term utility helicopter, which generally refers to medium-lift designs. Not all militaries are able to operate a full range of transport helicopters so the medium transport type as the most useful compromise is probably the most common specialist transport type. Medium transport helicopters are generally capable of moving up to a platoon of infantry and are capable of being able to transport towed artillery or light vehicles either internally or as under-slung roles. Unlike the assault helicopter they are usually not expected to land directly in a contested landing zone, but are used to reinforce and resupply landing zones taken by the initial assault wave. Examples include the unarmed versions of the Mil Mi-8, Super Puma, and CH-46 Sea Knight. Heavy lift helicopters are the largest and most capable of the transport types, currently limited in service to the CH-53 Sea Stallion and related CH-53E Super Stallion, CH-47 Chinook, Mil Mi-26, and Aérospatiale Super Frelon. Capable of lifting up to 80 troops and moving small AFVs (usually as slung loads but also internally), these helicopters operate in the tactical transport role in much the same way as small fixed wing turboprop air-lifters. The lower speed, range and increased fuel consumption of helicopters are more than compensated by their ability to operate virtually anywhere.